Dogs & other creatures I've treasured; past & present: Stories & reflections. ​It’s so easy to love a dog. Usually it takes but a single glance at an adorable dog for our human hearts to begin the slide. Should that same dog give us trusting, entreating eyes or worse, wide, desolate eyes, our hearts tumble, quickly gaining momentum. As soon as physical contact is made & the dog delivers the coup de grace: the face lick, it’s all over but for buying the Nylabones; our hearts have rolled to the cliff’s edge & sailed gleefully over the precipice, destined for the greatest unknown of all: Love. ​Falling in love with a dog is the easy part. It doesn’t take any logical thought process, it’s all about emotion. What comes after falling in love with a dog is what may lead to heartbreak if a dog’s Person fails to build on the relationship properly. As in marriage between human beings, companionship between a dog & his Person takes hard work. Love alone cannot build a solid relationship. I fell in love with a photo (online) of a sad, old Labrador at our local animal shelter. I fell right into Finnegan’s deep, sad eyes & knew in my heart that he belonged with me. When I went to meet him, Finn was a neat old dog, but barely gave me the time of day. You see, he didn’t know me. He’d been at the shelter for several weeks & countless people were passing in & out of his view day after day. I was just one of many. Why give me any special regard? Fortunately, after a lifetime of loving dogs & dealing with rescues, I understood what I was seeing & wasn’t a bit put out by Finnegan’s behavior. I returned the next day with my husband & daughter. Ah! But this time; this time Finn took notice that I had returned a second time! I had gained some status in his opinion, perhaps a teeny bit of regard. He shared attention & affection with each of us during our visit & it was wonderful. Still, he was more than happy to leave the room. Although he had recognized me, I wasn’t anyone special to him. Finn has been with me for exactly one month now. 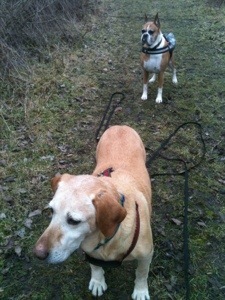 It’s interesting to compare that initial vet visit with a hike through a nature preserve we enjoyed a couple days ago. First off, instead of having to coerce him or physically lift him into the van, Finnegan loaded himself for the trip to the preserve. He trusts that he will be safe with me. Once we arrived at the preserve, I asked Finn to sit while I got his long-line attached to his harness, with the van door wide open. I didn’t worry that he would bolt because I trusted him to stay with me. That trust was earned from a month of shared training & long walks in our wide back pasture. As we hiked with Finn on a thirty-foot long-line, he rarely ran out more than ten feet of line before coming back & nosing my hand. The majority of the hour & a half hike was spent with Finnegan glued to my hip. A few times when he did trail out to sniff something I’d practice a recall to see how he’d do; just fine. Finn trusted enough to explore away from me at times, but respected our bond enough to come at the recall. When we passed other hikers & other hikers with dogs, Finnegan sat on command or hand signal & showed little interest in the passers-by. His focus was nearly always on me. He was constantly checking to see where I was & what I was doing. This was funny because I was usually three inches away from him… Still, he was confident enough to trust that I would not let him come to harm from other dogs or strangers. It seems that I have become Finn’s Person, which was of course my fondest Christmas prayer this year. We’ve built a good beginning trust, he & I. I know that he has fears & limits that I must always be conscious & conscientious against which not to press him too hard. And he seems to trust that I will be his strength when he needs it, like when he is tortured by nightmares & cannot awaken. After nights & nights of comforting & holding him, he is finally sleeping soundly. We’ve come quite a distance in only a month, this wonderful, faithful Finnegan & me. We are building something together that no one else can see & maybe no one else will ever understand… But that’s okay, because it’s all intertwined with trust & trusting in Love – & since Love is still the greatest unknown of all, no one really expects to understand. Thanks for visiting & peeking inside; I hope you become a regular visitor! 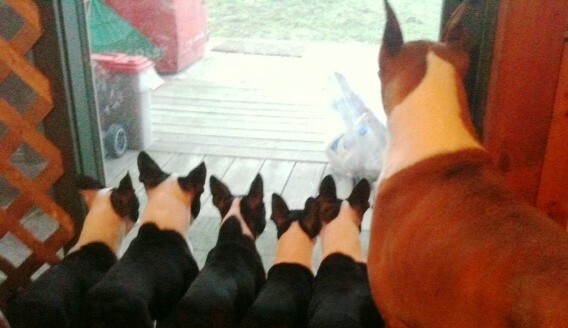 © Carlene Gray/GrayHaven Bostons & VelcroDogBlog.com (velcrodogblog.wordpress.com); 2012 & beyond. Unauthorized use and/or duplication of this material without express & written permission from this blog’s author &/or owner is strictly prohibited. Excerpts & links may be used, provided that full & clear credit is given to Carlene Gray/GrayHaven Bostons & VelcroDogBlog.com with appropriate & specific direction to the original content. I'm a writer; my ideas & words are my greatest personal treasures, worth more to me than any bauble or retirement fund - Heck, they may BE my retirement fund, if all goes as I pray! Please don't steal them! Thanks so much for being honorable & human(e).